Painting is when the application of color, paint or pigment is applied to the surface of an item. 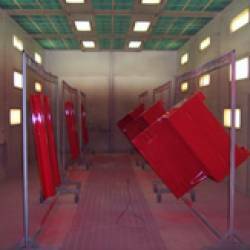 At AH Stock Manufacturing, we have a state of the art down draft painting facility with curing capabilities to 200 degrees and an in-line paint mixing system. Our blasting capabilities consist of a 15' x 25' booth and cabinet blaster for smaller parts. At AH Stock Manufacturing Corp., we offer our customers a solution to all of their manufacturing needs, from engineering to finished products. In addition we offer a wide variety of value-added services in our manufacturing process, including: de-burring, painting, baking, polishing, finishing and more. We have the ability to finish almost all materials including machine steel, aluminum, stainless steel, most alloy steels, titanium, most plastics, and more!